GERD (GastroEsophegal Reflux Disease) has always haunted the masses, because of the discomfort it causes. The main reason for discomfort is not related to the acid production, but the mechanical dysfunction of your lower sphincter. 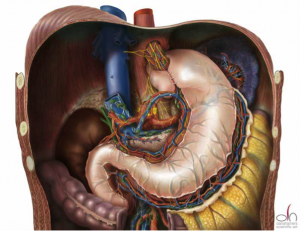 Now, in order to treat this disease, Laparoscopic Nissen Fundoplication is acknowledged as the standard surgical treatment due to its least invasive and highly precise nature. 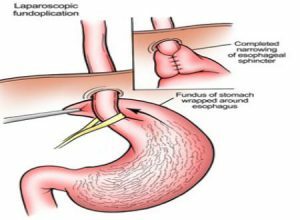 The fundoplication surgery involves the wrapping of upper curve of the stomach around the esophagus and is sewn in place to allow the lower portion of to pass through the stomach muscles. This procedure tightens the valve located in between the esophagus and stomach. It ultimately halts the acid from seeping back into the esophagus. GERD could be caused due to an array of reasons but a hiatal hernia is one of the mainstream causes of it. Fortunately, the hiatal hernia is spontaneously and automatically resolved during the fixation of GERD. It should be noted that all the GERD related treatments must be safe and you must ensure the proficiency of your doctor because if the procedure causes any harm to your esophagus or even if the 360 degree gets tight, your ingestion is troubled. Fortunately, the risk of all these problems is diminished in fundoplication. If your condition becomes acute, you might not be able to eat anything and it seriously damages your esophagus. 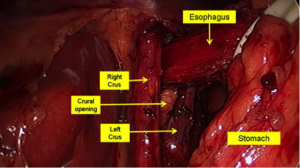 If you go for a more invasive or rather ‘open’ operation, you might even hurt your esophagus and that is where the problem gets worse. The invasive methods are very restricted and you are pretty much safe from any ‘unintended’ and ‘unwanted’ cut. Yet again, the healing process is very fast if you have undergone a fundoplication procedure and the credit goes to the least invasive nature once again. Allows a speedy recovery and you are discharged from the ‘over-protected’ environment of the hospital, fairly quickly. After all, it is an operation and the use of an anesthetic is mutual for all surgeries. But the fundoplication treatment reduces the post-surgery pain to a great extent and it is pretty understandable here because relatively less body mass is exposed to the cutting tools! It spins around very quickly and you could hit your office within three weeks after the surgery – this is almost half of the time, as compared with the open surgery. Not only is the procedure least invasive, but if you go for traditional methods to treat GERD, you might face an annoying list of ‘food prohibitions’ and a life-long treatment. Since it is not the case with fundoplication, it saves you a lot of money. Whether you go for laparoscopic or an open surgery, a surgery is a surgery and requires proper care in the days to come. Even if you undergo fundoplication, you have to be very cautious about your diet. Avoid eating heavy meals. It would be best if you go for the liquid or semi-solid foods until your inner wounds/stitches heal.